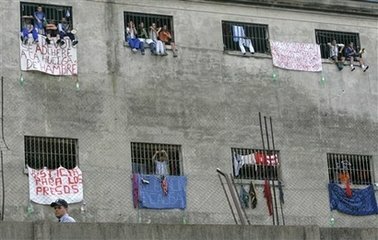 Argentina – After two weeks, over 14,000 inmates in nearly 30 prisons across Argentina have called off their hunger strike and declared victory. During the strike, which was nonviolent, prisoners maintained communication with officials. The goal of the strike was to fight not only for better conditions, but mostly for speedier trials, as 80% of those imprisoned were awaiting trial, and some were not scheduled to appear in court until 2013. The strike ended when the highest court in Buenos Aires ruled that time served prior to a trial would count as part of eventual sentences. Trenton, New Jersey, US - New Jersey State Prison inmates are threatening to stage a hunger strike next week if the Department of Corrections refuses to address demands stemming from a recent lockdown. The lockdown, which started after a hidden loaded handgun was found by guards, was "reminiscent of Abu Ghraib," as some prisoners put it. Stripped to their underwear, inmates were forced to walk through a gantlet of officers and aggressively barking and lunging dogs. Officers also trashed inmates' cells and destroyed their property during prisonwide searches for more weapons. The lockdown also involved inmates being locked in their cells for three weeks and losing all of their normal activities.